at St Andrew’s Psalter Lane Church, 6.00 – 9.00 pm on Thursday 13th December. Come and have a great evening singing Sheffield Carols with family and friends. Free Entry, Homemade refreshments and Christmas gift stalls. 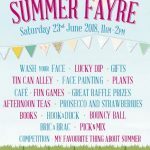 Saturday 23rd June, 11.00 am – 2.00 pm Stalls – Cafe – Games – Raffle – Competition – Prosecco and Strawberries! In aid of the Clifford PTA and St Andrew’s Psalter Lane Church.